There have been calls in recent days for Commissioner Nóirín O'Sullivan to step down from her position. 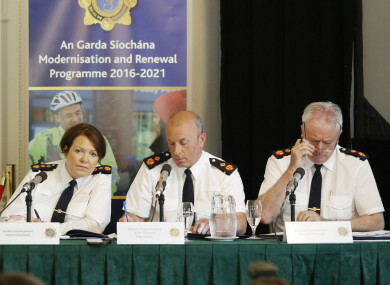 A NEW SURVEY commissioned by An Garda Síochána has found the level of trust the Irish public has in the organisation has fallen since the start of this year and almost two-thirds of the country believe the organisation is not well managed. The Garda Public Attitudes Survey for Q2 2017, which is conducted by Amarach Research, found 88% of people have a mid to high level of trust in gardaí. This is down 4% from the first quarter of the year. There was also a decline between the first and second quarters of this year in terms of the organisation being friendly or helpful (-2%), community focused (-2%), modern or progressive (-2%), providing a world-class police service (-5%). There was no change in the number of people who believe gardaí are effective in tackling crime. The largest reduction was in the number of people who think the organisation is well managed, down 6% to 37% in the second quarter of the year. These latest figures come as the Garda Commission Nóirín O’Sullivan is under fire over the inflation of breath test figures. An internal investigation found more than 1.4 million false tests were logged on the Pulse system. It was also revealed yesterday that the Central Statistics Office (CSO) has decided to delay the publication of crime statistics because of a review into 89 homicides that were not counted over a 14-year period. There have been calls for the Commissioner to step down over recent controversies, including the breath test scandal and financial irregularities in the Garda College in Templemore, but Taoiseach Leo Varadkar has maintained that he has full confidence in O’Sullivan. According to the organisation’s own survey today, there was a 3% drop in the number of respondents who said they were either very satisfied or satisfied with the service provided to local communities. Almost one fifth of respondents said they were quite dissatisfied and 4% reported being very dissatisfied. One positive statistic from the survey is the drop in the number of people who said they were victims of crime – down 6.9% from the first quarter of this year and a yearly reduction of 5.7%. There was a year-on-year increase in the number of people who reported their most recent crime and satisfaction among victims who reported a crime to gardaí is now at 61%. Almost half of those surveyed said they do not worry about becoming a victim of crime. When it comes to visibility in communities, just 36% of people were aware of garda patrols in their local area and less than half considered garda presence in their area to be at the right level. Commenting on the results of the survey, Deputy Commissioner John Twomey said it was welcome that fewer people were saying they had been victims of crime and that fear of crime was reducing. “It is vital that we continue our strong focus on preventing crime from happening in the first instance, but, when it does happen, investigating those crimes and helping the victims,” he said. Email “Garda survey finds almost two-thirds of Irish public think force is not well managed”. Feedback on “Garda survey finds almost two-thirds of Irish public think force is not well managed”.